Planning for the upcoming grazing season is important and should include factors such as estimated stocking rates, time of grazing for specific pastures, as well as contingency plans in the event of dry conditions. Photo courtesy of Jerry Volesky. The start of the growing season will be here soon and it is time to finish up grazing and forage plans for the upcoming year. In 2017, many areas in the state experienced dry conditions during the month of June and some areas were very dry during both June and July. This resulted in range and pasture production that was about 15 to 30% below average, and subsequently, grasses in many pastures were shorter and there was less total remaining vegetation at the end of the 2017 grazing season. That residual or ‘carryover’ grass can be very important from several aspects. During the drought in 2012, for example, abundant carryover grass from 2011 (a very wet year) supplied some forage during 2012. Additionally, dry conditions during the previous year have residual effects on plant vigor and often set back herbage production early in the growing season of the following year. A recent U.S. Drought Monitor generally shows favorable conditions for most of Nebraska (Figure 1). While long-range forecasts can be challenging, some climate predictions have expressed concern about the potential expansion of drought conditions into Nebraska from the south or from the north. Regardless of the exact growing season conditions we will have, developing a well-defined grazing plan is important. And, a drought plan is always a key part of the overall grazing plan. In 2017, most areas in Nebraska received good late summer and fall rains which has benefited recent soil moisture conditions (Figure 2). This soil moisture will be beneficial at the beginning and early part of the growing season. April precipitation also supports the initial growth of cool-season pasture grasses, but these species produce the majority of their growth during the month of May. April and May precipitation, as well as temperature, are the two primary factors that might affect spring pasture growth and turn out dates. Warm-season grasses generally initiate growth in May with rapid accumulation of growth in late June and July. Grazing plans should include projected cattle numbers (or stocking rates), turn out dates, and a pasture use sequence for multiple pasture rotations. For those livestock producers that use various types of rotational grazing strategies, it is important to review grazing records from the previous years when planning the rotation sequence for 2018. Consideration should be given to when the time or period of grazing occurred in the previous years and the amount of residual forage in that pasture from the previous year. Plans should adjust the schedule to avoid grazing the same pasture at the same time period in consecutive years. As we would expect, there is a strong correlation between spring and early summer precipitation and pasture productivity. In a mixed cool- and warm-season grass rangeland, such as the Sandhills, there can be 70 to 80% of the season’s total production occurring by late June. Rainfall in late July or August generally does not contribute to substantial growth for that season; but slows maturation of warm-season grasses and may benefit some fall growth of cool-season species. A drought plan can have varying levels of detail and complexity and can be customized to fit the specific needs of your operation. Some plans place an emphasis on critical or trigger dates. These are dates where one evaluates their total local precipitation up to that date. On May 1, for example, one could determine their total April precipitation or the total effective precipitation since the previous fall and compare that to long-term averages for their area. If precipitation totals are significantly below the averages, that could trigger a choice of several possible management actions such as an extended period of feeding hay or culling of some livestock prior to turn out. These actions should be adjusted to account for varying levels of expected drought. Other important dates for making drought management decisions in relation to critical periods for rapid grass growth might include May 15, June 1, June 15, and July 1. Additional details and worksheets for all the components of a drought plan can be found at the Managing Drought Risk on the Ranch website. Now is also a good time to finalize plans for the planting of spring or summer annual forage crops that might be grazed, hayed, or harvested as silage to replenish feed supplies. This includes selecting the forage crop type, fields that will be planted, identifying seed sources and ordering the seed. Oats, spring triticale and barley are annual cereal grains that can be planted from late March to early April to produce forage that can be grazed beginning in mid to late May or harvested for hay or silage in late June or early July. Growth of these cereal crops is very rapid in late May and early June, requiring good grazing management and the proper stocking rate to efficiently harvest the forage. Forage peas are a legume that can be mixed in with spring cereals to reduce nitrogen fertilizer needed while maintaining or improving the protein levels of the harvested crop. When selecting a spring cereal to plant, preference should be given to varieties that have been selected for forage production. Select hooded or awnless varieties of barley if the crop is going to be harvested as hay. The quality of the forage produced from spring cereals will depend upon the stage of maturity at harvest. As maturity increases, quality declines rapidly. The optimum compromise between quality and yield generally occurs shortly after boot to early heading stages. Yield in terms of dry matter produced per acre generally increases 10 percent to 20 percent from the boot to early heading stages. The primary warm-season or summer annual forages would include sudangrass, forage sorghum, sorghum-sudangrass hybrids, pearl and foxtail millet. As warm-season species, soil temperatures at planting should consistently be at the 60 to 65 degree level which is usually achieved by late May. These warm-season annuals could also be planted anytime up to early August and still produce forage, but greater amounts will be realized with earlier planting dates. Additional information can be found in this annual forage systems webinar. 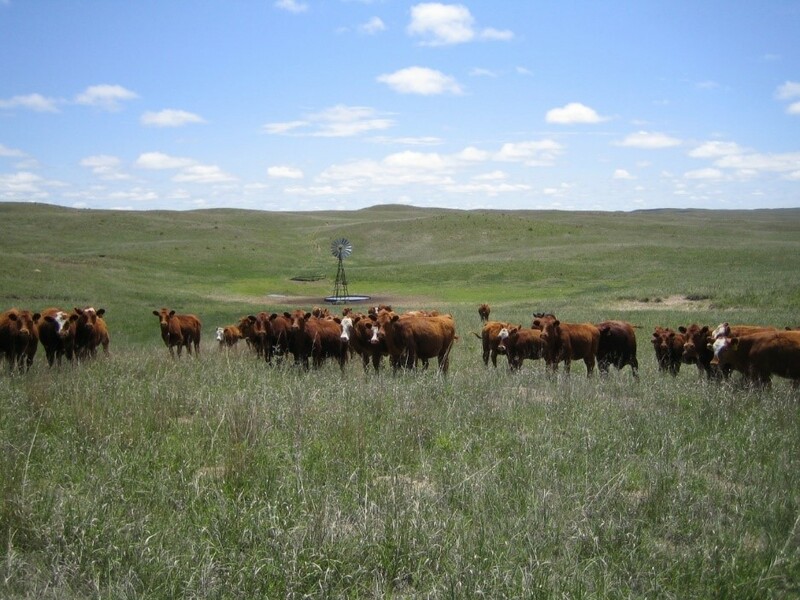 Find more information in the NebGuide: Utilizing Annual Forages with Limited Irrigation for Beef Cattle During and Following Drought.